Is it a beverage or is it a dessert? 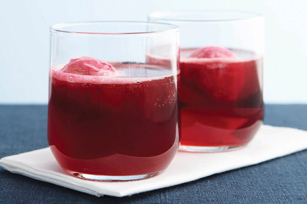 Our Raspberry Ice Spritzer recipe is a bit of both. It’s also delicious, fruity and perfect for sharing with guests! Stir drink mix with 4 cups cold water in pitcher until mix is dissolved. Add lime zest and juice; stir until blended. Stir in sparkling water just before serving. Top with scoops of sorbet. For added colour and flavour, use a mix of colours and flavours of sorbet or sherbet instead of the raspberry sorbet. This flavourful spritzer can be part of a healthful eating plan.